In this Great Time, everything lose their normal boundaries: feat, betrayal, mercy, cruelty, suffering, enthusiasm, loyalty, compassion, familyhood, friendship, indifference – everything permeates with God's will, illuminating with new light, the Orthodox light, Great light ... the Holy week is a summary of world history, a summary of life, the way of man, salvation of the great compassion of God. The fabric of the week reaches far beyond this reality. “Those in the tombs”, it is about us, about us. Our bodies, our works, our thoughts and feelings are “those in the tombs”. The world that is not enlightened by Christ, is hiding from him, slipping away, not trusting, not open to his heart, not hot, but cold, covered by rain, is a world “in the tombs”, and “those in tombs” live in it... And they (that is, us), “those in tombs”, are opened to a new heaven and a new earth, they are selected on the surface of the lower level of gloom and Acedia, and look at the eternal rays of light and wonder: have we never seen it. We meet Christ, our Savior, we open our hearts and mouths and let the sweetness of regeneration into the dim twilight of our soul. Indeed, He is Risen! And it is irrevocable and eternal, and the gates of hell are trampled, and the enemy is crushed, and the invincible victory is granted to us. The faith in Christ is the Russian faith. It can be objected: Orthodoxy is the universal Church, it is open to all mankind. Identifying it with the Russians means to narrow its value, reduce it to the national religion. There is a notion of the phyletism heresy, religious “love toward a nation.” For the enemies of Orthodoxy, especially for Western Christians, it is the central argument against the Byzantine Empire and against Russia. Unfortunately, in 1872, the patriarch of Constantinople, the head of the Phanar fell for it. But what do they know? They abolished the sacred Julian Calendar, giving up the basics of Orthodoxy for the Uniate... What do they know, my friends?.. Dancing ... The Great Days are the Russian Days, the Bright Week is the Russian Week. 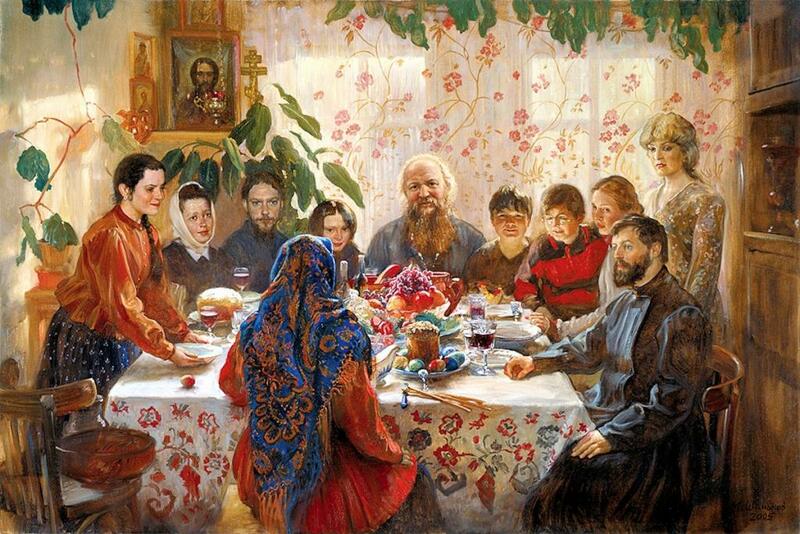 On Russian Easter, the nature of the world resurrects our nature, mother-desert, luxurious, like a lady, like a virgin, like a universally acute painful comfort. Suffer with us, die with us, kill with us, sing with us, come with us, disappear with us, unite with us, fast with us, cast down with us, vanish with us, love with us, hate with us, to rise with us again, to enter the Russian Easter, the Great Easter of Christ. The fact that the Russians are the great people is an axiom, it cannot be proven, as it does not require it. This true greatness does not humiliate others, it does not make them smaller. As the resurrection does not kill, does not trample them, but saves them. The real greatness magnifies everything that it touches. There is no hatred, there is only delight, only happiness, joy and love. This is the dancing greatness. I’ve recently read a book by Evliya Çelebi, a traveler who was an Ottoman Turk who travelled through the Crimea. He said that at the beginning of the world, God by the omnipotence of His forefather created Adam with clay, making him Tatar like. A small nationalist (not Tatar) will be irritated. The rationalist will be skeptical. The Great Russian will feel a great joy and sincerity. That's great! Sly Turks guessed it! Of course, the first person was of the Russian people. But it doesn’t mean that he was not Tartar, Jewish, Armenian, Persian or Japanese. In the logic of Great Time, when the days are longer than a century, seven is one, there is a different arithmetic. Well done, Tatar, if he reaches the great, if he wants the crucified world to become more than he is now, so it's not just a Tartar, he is a Russian national Tatar, the first real man, comprehensible to us in its mystery, particular in its elusive greatness... Good Tartar, in other words, a native of Eternal Russia. Do not make from our spiritual holiday an edifying instruction. But there is nothing to hide: today is our holiday, our enthusiasm, today we raise and square our shoulders, raise our hands, kiss each other, embrace the world, and the universe is clarified through us, with us, for us, because the universe is Russian too, it should be Russian, we - and not only we - need it to be Russian, escaped from the hell of the present, left its tomb... and only shrouds will be left to our enemies. “Why do you look for the living among the dead?” He's not there. He is not here; he has risen! Shine! Shine! Shine, O' new Jerusalem! We know now that sweet favorite place where the nations will gather to meet you. We know it for sure.